Another peanut butter recipe? Here’s why. Preheat oven to 350°F. Place the peanuts in a shallow layer on a tray in the middle of the oven. Roast for 15-16 minutes, stirring every 5 or 6 minutes. The peanuts are ready when they have turned a darker shade of brown and have a glossy appearance. Meanwhile, set up a food processor with a chopping blade. For smooth peanut butter: Transfer the peanuts into the work bowl of the food processor (first photo from the left). Pulse the nuts until smooth and whipped, about 4 to 6 minutes, using a spatula or wooden spoon to push the peanuts down a couple of times. The peanut butter will gather itself into a rough ball and roll around on top of the food processor blades after about 3 or 4 minutes (second photo). Push the paste down and keep processing the peanut butter until it no longer holds together, another minute or two (third photo). Transfer to a glass jar and store at room temperature. 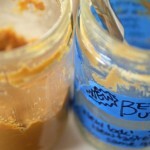 For chunky peanut butter: Measure out ¾ pound peanuts, reserving the remainder. Follow the directions for making smooth peanut butter. Once smooth and whipped, add remaining peanuts to the work bowl, and pulse until the peanuts are chopped and incorporated into the rest of the peanut butter (fourth photo). This should take about 30 or 45 seconds. Transfer to a glass jar and store at room temperature. 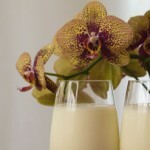 This entry was posted in Nuts, Recipes on July 24, 2014 by sandra.